Congratulations, I’ve got 1 month to go until my first arrives. I love the little baby longies and the socks, absolutely precious! Adorable! And congratulations! Nothing nicer than baby clothes – except the baby. Congrats! Look at all those adorable little baby knits! So cute. Oh congratulations! Your knits are lovely, lucky baby! OK, I feel like a complete idiot. I haven’t read your blog in so long that I didn’t even know you had one baby! Now I’m all caught up 🙂 Congrats! Congratulations! Smart baby to choose such an artful mom. Good luck with the remaining time, and I can’t wait to see this rug come to life! 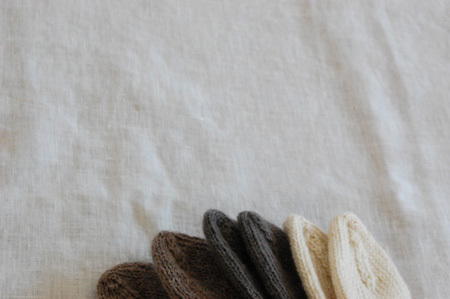 I’m loving the beautiful, neutral baby knits! these are so adorable. i especially love how you photographed just the tiny toes! I love the tiny socks. I would love to be able to knit socks like these. Congratulations and what sock pattern is that. They are adorable.